Friday night preparing hampers in Naujaat. Our journey to gather food items for Nunavut is underway. Renewed energies and idea sharing are percolating in Ottawa for Rankin Inlet, St Catharine’s for Naujaat, Burlington for Whale Cove, and Windsor for Gjoa Haven. 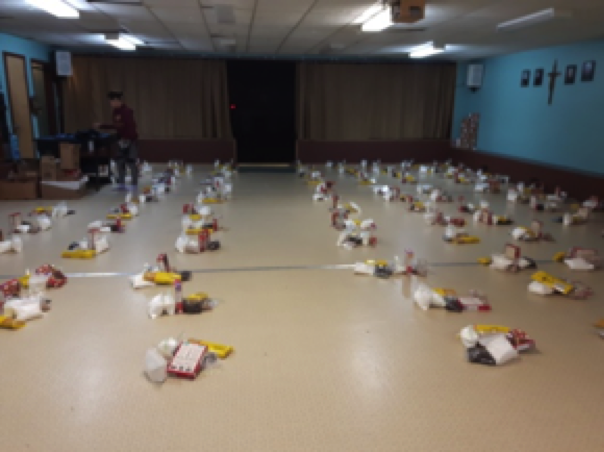 Food insecurity is a daily struggle for many Inuit throughout Nunavut communities. 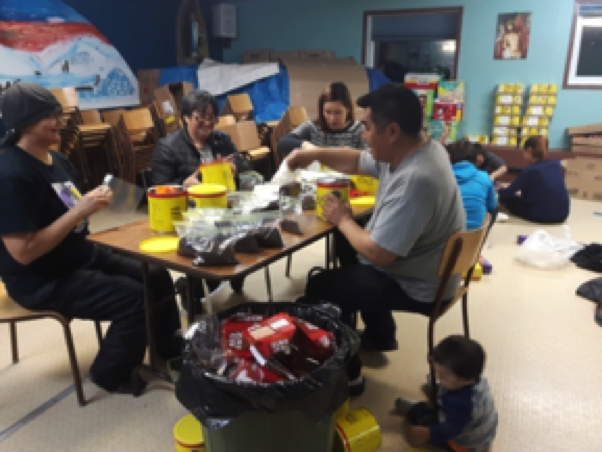 October 2017, I was in Naujaat and Rankin Inlet offering support to their food distribution set up. It was a huge learning experience deeply embedded in the Inuit tradition of sharing and cooperation. While there, two new communities reached out to me, asking – if possible – for our Vincentian help. To hear the priest speak on behalf of their communities emphasizing, “any food help will be a blessing” echoes in my heart. Fr. Quang of Chesterfield and Fr. Bo of Kugaaruk called me to share and color ‘help’ in their communities. And so my brothers and sisters I turn to you seeking that help. financial support through pass ups. This last gift of financial support allowed SSVP to feed Toloyoak last summer. They shared the food we sent with Kugaaruk, not surprising at all! Sharing is the Inuit way – without question. When I write these articles there is an overtone of sadness, BUT - I have seen the laughter, smiles, joy, and tears of thanks in the faces of the families. I wish I could share with you a piece of that to carry in your heart….we are doing amazing work. Thank you so very much for what you have done and I ask Our Lord to continue His Blessings upon you as we work together to gather and share in the lives of our sisters and brothers in Nunavut.